A CSV (Comma Separated Values) file is a file that uses a certain formatting for storing data. This file format organizes information, containing one record per line, with each field (column) separated by a delimiter. The delimiter most commonly used is usually a comma. This format is so common that it has actually been standardized in the RFC 4180. However, this standard isn't always followed and there is a lack of universal standard usage. The exact format used can sometime depend on the application it's being used for. CSV files are commonly used because they're easy to read and manage, they're small in size, and fast to process/transfer. Because of these benefits, they are frequently used in software applications, ranging anywhere from online e-commerce stores to mobile apps to desktop tools. For example, Magento, an e-commerce platform, is known for its support of CSV. In addition, many applications, such as Microsoft Excel, Notepad, and Google Docs, can be used to import or export CSV files. The csv module implements classes to operate with CSV files. It is focused on the format that is preferred by Microsoft Excel. However, its functionality is extensive enough to work with CSV files that use different delimiters and quoting characters. This module provides the functions reader and writer, which work in a sequential manner. It also has the DictReader and DictWriter classes to manage your CSV data in the form of a Python dictionary object. The csv.reader(csvfile, dialect='excel', **fmtparams) method can be used to extract data from a file that contains CSV-formatted data. This method returns a reader object, which can be iterated over to retrieve the lines of your CSV. The data is read as a list of strings. If we specify the QUOTE_NONNUMERIC format, non-quoted values are converted into float values. An example on how to use this method is given in the Reading CSV Files section of this article. The csv.writer(csvfile, dialect='excel', **fmtparams) method, which is similar to the reader method we described above, is a method that permits us to write data to a file in CSV format. A note of caution with this method: If the csvfile parameter specified is a file object, it needs to have been opened it with newline=''. If this is not specified, newlines inside quoted fields will not be interpreted correctly, and depending on the working platform, extra characters, such as '\r' may be added. The csv module also provides us the DictReader and DictWriter classes, which allow us to read and write to files using dictionary objects. The class DictReader() works in a similar manner as a csv.reader, but in Python 2 it maps the data to a dictionary and in Python 3 it maps data to an OrderedDict. The keys are given by the field-names parameter. And just like DictReader, the class DictWriter() works very similarly to the csv.writer method, although it maps the dictionary to output rows. However, be aware that since Python's dictionaries are not ordered, we cannot predict the row order in the output file. Both of these classes includes an optional parameter to use dialects. A dialect, in the context of reading and writing CSVs, is a construct that allows you to create, store, and re-use various formatting parameters for your data. Python offers two different ways to specify formatting parameters. The first is by declaring a subclass of this class, which contains the specific attributes. The second is by directly specifying the formatting parameters, using the same names as defined in the Dialect class. Dialect.delimiter: Used as the separating character between fields. The default value is a comma (,). Dialect.quotechar: Used to quote fields containing special characters. The default is the double-quote ("). Dialect.lineterminator: Used to create newlines. The default is '\r\n'. Use this class to tell the csv module how to interact with your non-standard CSV data. One important thing to note if you're using Python 2.7: it isn't as easy to support Unicode input in this version of Python, so you may need to ensure all of your input is in UTF-8 or printable ASCII characters. We can create a CSV file easily with a text editor or even Excel. 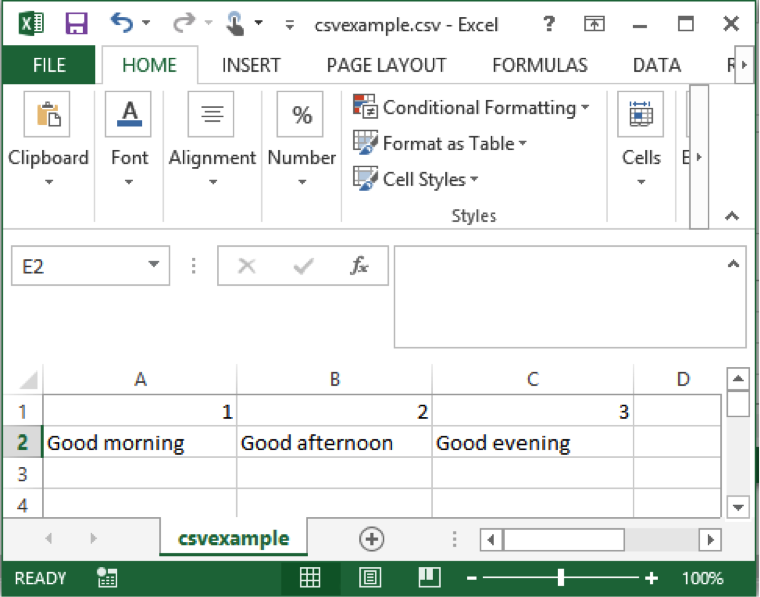 In the example below, the Excel file has a combination of numbers (1, 2 and 3) and words (Good morning, Good afternoon, Good evening), each of them in a different cell. To save this file as a CSV, click File->Save As, then in the Save As window, select "Comma Separated Values (.csv)" under the Format dropdown. Save it as csvexample.csv for later use. The structure of the CSV file can be seen using a text editor, such as Notepad or Sublime Text. Here, we can get the same values as in the Excel file, but separated by commas. We will use this file in the following examples. This is also valid CSV data, as long as we use the correct dialect and formatting to read/write the data, which in this case would require a '/' delimiter. In this code we open our CSV file as myFile and then use the csv.reader method to extract the data in to the reader object, which we can then iterate over to retrieve each line of our data. For this example, to show that the data was actually read, we just print it to the console. As we can see from running this code, we obtain the contents of the csvexample.csv file, which are printed to the console, except that now it is in a structured form that we can more easily work with in our code. The csv module allows us to read CSV files, even when some of the file format characteristics are different from the standard formatting. For example, we can read a file with a different delimiter, like tabs, periods, or even spaces (any character, really). In our other example, csvexample2.csv, we have replaced the comma with a forward slash to demonstrate this. As we can see from the code above, we have modified the third line of code by adding the delimiter parameter and assigning a value of '/' to it. This tells the method to treat all '/' characters as the separating point between column data. As you can see, thanks to the small changes in the code we still get the same expected result. Here we create and register our own named dialect, which in this case uses the same formatting parameters as before (forward slashes and no quoting). We then specify to csv.reader that we want to use the dialect we registered by passing its name as the dialect parameter. Again, this output is exactly the same as above, which means we correctly parsed the non-standard CSV data. Just like reading CSVs, the csv module appropriately provides plenty of functionality to write data to a CSV file as well. The writer object presents two functions, namely writerow() and writerows(). The difference between them, as you can probably tell from the names, is that the first function will only write one row, and the function writerows() writes several rows at once. The code in the example below creates a list of data, with each element in the outer list representing a row in the CSV file. Then, our code opens a CSV file named csvexample3.csv, creates a writer object, and writes our data to the file using the writerows() method. Similar to our "reading" example, we create a dialect in the same way (via csv.register_dialect()) and use it in the same way, by specifying it by name. In many cases, our data won't be formatted as a 2D array (as we saw in the previous examples), and it would be nice if we had better control over the data we read. To help with this problem, the csv module provides helper classes that lets us read/write our CSV data to/from dictionary objects, which makes the data much easier to work with. Interacting with your data in this way is much more natural for most Python applications and will be easier to integrate in to your code thanks to the familiarity of dict. Now, the format of this data might look a little bit different than our examples before. The first row in this file contains the field/column names, which provides a label for each column of data. The rows in this file contain pairs of values (country, capital) separated by a comma. These labels are optional, but tend to be very helpful, especially when you have to actually look this data yourself. We still loop through each row of the data, but notice how we can now access each row's columns by their label, which in this case is the country. If we wanted, we could also access the capital with row['capital']. We can also create a CSV file using our dictionaries. In the code below, we create a dictionary with the country and capital fields. Then we create a writer object that writes data to our countries.csv file, which has the set of fields previously defined with the list myFields. Following that, we first write the header row with the writeheader() method, and then the pairs of values using the writerow() method. Each value's position in the row is specified using the column label. You can probably imagine how useful this becomes when you have tens or even hundreds of columns in your CSV data. CSV files are a handy file storage format that many developers use in their projects. They're are small, easy to manage, and widely used throughout software development. Lucky for you, Python has a dedicated module for them that provides flexible methods and classes for managing CSV files in a straightforward and efficient manner. In this article we showed you how to use the csv Python module to both read and write CSV data to a file. In addition to this, we also showed how to create dialects, and use helper classes like DictReader and DictWriter to read and write CSVs from/to dict objects.